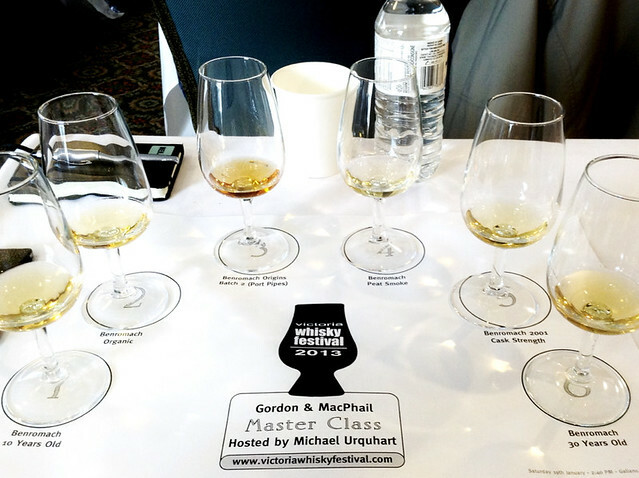 My second tasting of the main day of the Victoria Whisky Festival was with Michael Urquart of Gordon & Macphail. 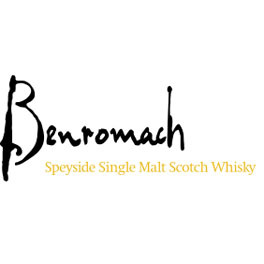 While it was titled as a general G&M tasting it instead focused on a key part of their range – whisky from their distillery, Benromach. I’ve written about the Benromach before, way back in the long long ago when I visited, but I didn’t get to try much whisky. So here’s some notes on the drams that we had on the mat. First up was their flagship single malt, Benromach 10 years old. The whisky is a mix of 80% bourbon and 20% sherry cask matured spirit, aged for 9 years and then married and refilled into first fill oloroso for a year before bottling. 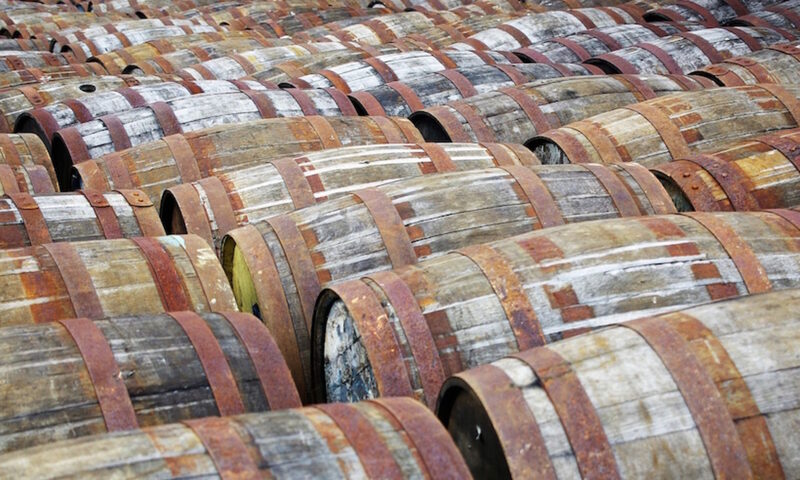 They get their wood from Williams & Humbert and they are European oak former solera casks – rather pricy pieces of kit that have been thoroughly soaked with sherry before their use maturing whisky. Gordon & Macphail’s history as a grocer and wine seller means that they have long standing connections in the sherry industry, giving them access to some great wood. The whisky itself had a nose of runny honey, light gravelly smoke (they peat the barley to 10-12ppm, although almost all of that smoke disappears by the time the wash is distilled), green ferns, sweet apple, cinnamon, dry wood and some waxy window putty. To taste it had soft woody smoke, light custardy vanilla, apple skin, dark woody spice, hints of raisin and quite a bit of wood. It finished with light smoke, apple skin tannins and damp wood. Next was the Benromach Organic Special Edition, a whisky which I wasn’t particularly fond of last time – their original organic was my favourite whisky of the day when I visited, but this second edition isn’t really for me. They’ve kept the new, sustainably farmed Missouri oak casks (to make it easier to be classified as organic – only the wood itself needs to be classified as such rather than any previous occupant as well) but the barley is peated to the full 12ppm maximum that they use, rather than the unpeated malt of the first edition. This seems to be a couple of releases down the line from the early Special Edition I tried in 2010, aged for approximately 7 years rather than the 5-6 of a few years back. On the nose it had dark rubber smoke, tar, cinnamon balls and a syrupy sweet undertone. To taste it was light, sweet and fruity, with smoky burning ferns, some waxiness (picked up as crayons by Jer Scott aka @BoozeDonkey) and a touch of fruitcake at the end. It finished with earthy smoke, a touch of fruit and some woody spice. Much better than I remember but still a bit tarry and uninteresting for my liking. Michael did mention, as Sandy the tour guide mentioned three years ago, that they would eventually be going back to the original unpeated organic recipe, so it seems I may not be the only one who isn’t a fan. Third was Benromach Origins Batch 2, a series of whiskies continuing on the experimentation of Michael’s late father George – he tried filling filling brandy and port casks back in the 1980s (if not earlier) which sold rather well at 20 years old and inspired the company to do a bit more playing around. The first Origins release used Golden Promise, the old school barley of choice for many grain obsessives, this second edition matured the whisky in port pipes and the most recent third release used Optic barley, another favourite. The batch 2 was distilled in 1999 from very lightly peated (2-3pmm) malt and bottled in 2010 at 50%. On the nose it was quite tannic and mouth puckering, with dry winey wood, sharp blackberry jam, sweet cream and a hint of vanilla. To taste it was sweet, with dark chocolate, more jam, lotsa of woody spice, hot cinnamon and dark wood, with water adding in even more chocolate. It finished with still more chocolate, damp dark wood and a tingle of alcohol heat. An interesting dram this, which reminded me of the bits I like in the Penderyn Portwood 41 (the first batch, at least – the second wasn’t as good) – I may need to investigate port matured whisky in more depth. Fourth was the Benromach Peat Smoke, their bourbon cask matured, much smokier than usual whisky. The barley is peated to 53ppm using peat cut from Speyside, rather than the occasional salty coastal and island peat. This edition was distilled in 2004 and bottled in 2012. On the nose it had lemon cream, pine, light tar, some sweetness, ferns and musty damp wool. To taste it was soft and oily, with a light pine/fern smoke, vanilla cream, soft ground spice and brown sugar. Water brought more intense lemon notes (towards the floor cleaner end of things) to the nose, along with more sour fruit and syrup sweetness to the palate. It finished quite mineralic (I think that’s a real word…) with sour, muddy smoke. The final whisky of the session was one I’d been looking forward to – Benromach 30 year old. Distilled way back before G&M owned the distillery, but bottled from a combination of their own stock bought at the time (G&M have been an independent bottler for about 100 years…) and other casks that they’ve managed to buy back from previous owners Diageo and elsewhere. There isn’t a lot of older Benromach out there as other than that picked up by third parties it was mainly used by Diageo and its forerunners for blending, vatted away when still young. The bottling is vatted from sherry matured spirit, a combination of 1st and refill casks.